Mercury is a toxic element of particular concern for the environment and human health, but its accurate analysis is challenging due to its unique physical and chemical properties. In order to enhance the quality and traceability of measurements, a proficiency testing (PT) program (MFDS-PT-101FM-2017) for mercury in oyster tissue has been conducted by the Ministry of Food and Drug Safety (MFDS) of Korea. A majority of the participating laboratories have used commercial mercury analyzers based on thermal decomposition amalgamation atomic absorption spectrometry (TDA–AAS). Good agreement between the participants’ results and the reference value (RV) was observed, where the RV is traceable to the International System of Units and verified for international equivalence. 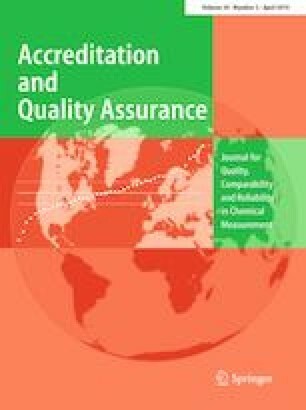 The results of this PT program support the participating laboratories in demonstrating their competence in quantitative analysis, and show the potential of commercial TDA–AAS systems for accurate mercury analysis. The online version of this article ( https://doi.org/10.1007/s00769-019-01379-7) contains supplementary material, which is available to authorized users. This study was supported by MFDS under the project “Development of standard samples for 2017 proficiency testing of MFDS (I)” (Grant No. 33173019300), by KRISS under the project “Establishing Measurement Standards for Inorganic Analysis” (Grant No. 17011050) and the project “Establishing Measurement Standards for Analytical Chemistry” (Grant No. 18011054).